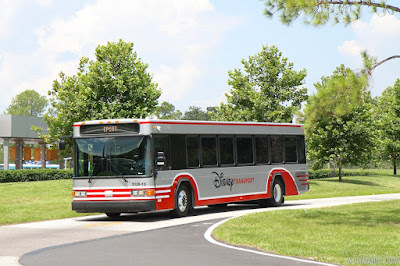 Guide4WDW.com: Paid Express Bus Service is Set to Debut at Walt Disney World! Paid Express Bus Service is Set to Debut at Walt Disney World! As the trend continues for paid add-on services at the Disney Parks, a new bus service is being offered beginning December 7th. The service, which costs $15 per guest per day, allows individuals to be picked up within the theme parks at designated locations and taken to other parks on property. The service is scheduled to operate from 10am to park closing with shuttle busses arriving every 30 minutes. An additional option of the service is a $24 per person multi-day express ticket. However, annual pass holders can only purchase the single day use option. Each of the parks is set to have it's own designated pickup location which will be placed in backstage areas. The released stops are near the Carousel of Progress and Buzz Lightyear's Space Ranger Spin at Magic Kingdom, Near Spaceship Earth at Epcot , Just Outside of Rockin' Rollercoaster at Hollywood Studios, and in Africa Near Kilimanjaro Safaris at Animal Kingdom. The busses will utilize alternative routes and backstage areas to transport guests quickly and efficiently to their desired location. According to current news, for now there is only one pick up location at each of the 4 main parks. Water parks are not being included in the service at this point. If you intend to purchase this additional service which is completely optional, you may add it on to your ticket when you purchase theme park admission or you can visit guest service locations throughout each park and add it on there as well. Granted that this is a paid service and an add on that should not change the guest experience for those who do not participate, I can appreciate the concept. However, due to the location of these bus stops, the "behind the scenes" views may deter from a certain level of "magic" the on-stage areas of the parks create. Let us know what you think down below or join the conversation on Facebook and twitter!